A professor tells students to find some materials about a class subject with their smartphones during class. The students try starting the internet application, but it is not working because the Wi-Fi signal is too weak. After the class, they go to a student lounge with friends to have a chat, but the student lounge is full of other students studying. They cannot talk together in this quiet place, so they just decide to go to a café. Many students face this situation on campus, especially during the exam term. 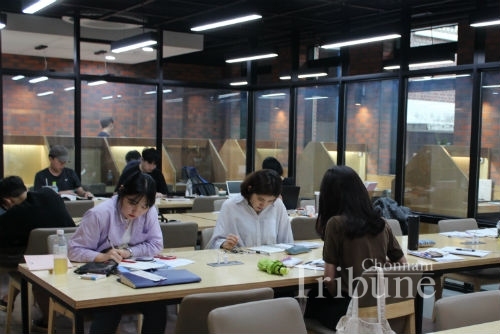 The Chonnam Tribune examined students’ satisfaction with the convenience of facilities such as the student lounge, Wi-Fi and cafeteria and the school’s effort to solve problems. Students need resting spaces where they take a brief rest during break time in their college buildings at Chonnam National University (CNU). They usually go to a student lounge or a common room during a break, but the number of students using a building is numerous, so often students cannot rest in the lounge because there are no seats left. As a result, students who could not find any seats have no choice but to go to other places like a café. Mun Seon-ju (Sophomore, Faculty of Business Administration) said that she sometimes could not use a student lounge because there were too many students in the room. “Especially, the Jinli building is the place that the most number of students taking liberal arts classes visit on Yongbong campus. Last semester, a lounge on the sixth floor of the building has changed into a classroom even if students need more places to rest. Sometimes I cannot rest in the Jinli building, because there are no seats left, especially during the examination period,” she said. As the lounges are disappearing, some students have complained about it, even though CNU has more than 45 resting places on Yongbong camps, according to the data of the Office of Planning and Coordination. Actually, many students answered that they are not satisfied with lecture rooms and facilities for students in the 2017 University Overall Satisfaction Survey (UOSS), and the question had the lowest score from the respondents. Authorities endeavor to improve the problem to students’ satisfaction. Na Geum-soo, head of Registrar’s Office said that they did not know that students felt inconvenience due to the lack of resting space. “We do not think we have narrow resting spaces compared to other universities. We planned to open a lounge on the sixth floor of the Jinli building to be used for both a classroom and a lounge. Except during class time, students can use this place anytime,” he said. As the Internet goes along with our daily life, it is hard to imagine our lives without it. CNU students are not the exception. They use the Internet to find some things or to just relax with mobile contents. However, Wi-Fi, which is one of the ways to be connected to the Internet, has many problems on campus. Some Wi-Fi signals are weak in certain places and many students do not even know the fact that actually there are many different Wi-Fi modems, not only ‘JNU’. Kim Sun-ju (Sophomore, Dept. of English Language and Literature) said she had inconvenience in a building of the College of Humanities, because the Wi-Fi signal was so weak there. “I did not even know that there are other Wi-Fi signals except the school Wi-Fi in our university buildings,” she said. In fact, according to the result of the UOSS last year about school facilities, the ‘convenience of using the Internet network’ got the lowest score in the campus informatization section. Muslim students attending CNU use school cafeterias for their lunch, but they have a narrow range of choices. Especially, most meals in the cafeterias located on Yongbong campus contain pork they cannot eat. Therefore, many Muslim students have complaints about it saying that they need cafeteria menu options for people who do not eat pork like them. Bakhtiyorjon Komilov (Junior, Faculty of Economics) said, “When I went to a school cafeteria and tried other meals, I could not eat them. That day, I stayed hungry and wasted my money and time.” He added that he always ate the same meal without pork at the cafeteria. With regards to the menu at the school cafeteria, authorities answered that it was difficult to serve vegetarian food or many types of food without pork including halal food because there were few students who ordered them several years ago. Currently, the number of Muslim students is too small compared to Korean and other international students. Therefore, it seems hard to prepare food just for Muslim students. Shin Mi-sook, head of the school cafeteria in Student Union I, said, “If our company does not think a new particular menu is needed, it cannot be served in the cafeteria. We do not have a plan to serve such meals yet, but we will discuss the problem with the company,” she added. On-campus convenience facilities mentioned above are the basic infrastructure for all the members of the university including students. The result of the 2017 UOSS showed the level of student satisfaction on convenience facilities such as Wi-Fi, student lounges, and cafeterias. In order to enhance their satisfaction with the facilities, the current administration of the university has made an effort to reflect the opinions of students and to solve problems. It is important that we pay attention to the facilities and services. Therefore, in case there is a Wi-Fi problem, students need to know the appropriate information on the website of the computing center to use it well. Meanwhile, regarding the open resting space and cafeteria menu, it is necessary for the authorities to understand students’ needs and to come up with solutions. It is true that preparing food for a small number of students is not easy, but it is crucial for their daily life. For a better and a more convenient university life, all the members of the university should show their efforts more.